Imho everyone coming on here is interested in this feeling of just being NATURALLY taller. We all just want to be naturally taller – most of us probably to an impractical degree if we were given the chance! But it must be undetectable and feel totally 100% right. And when you realize it is so easy if you follow the rules, the real pleasure in it is incredible. Also I am not talking about the advantages of being “tall” – just the advantages of being taller than you are. Whatever your height. For me the most amazing feeling, and I know this is the case with the majority of guys I have talked with through here about adding height, is the buzz that you get being even just that bit taller. This is irrespective of who you want to impress or the impact on others. For yourself it just feels so cool. In a doorway, by a day-to-day object like a fridge or shelf, you just see and feel a different perspective almost and it gives a great lift – both literally and in the mind. It’s impossible to properly evaluate the value of that, but to me I know it has had a great impact on my life. Even just a couple of inches makes a great difference, whether you are short or tall already. I wear elevators now all the time when I am out but still whenever I put on a pair of elevators, whether at the low or high end of height addition, OMG it feels so good lifting up to a bigger height. And this is why I always say, if you are not sure but might already add a bit of height through lifts or whatever, then if you have any reservations, give it a go with just a pair of lower elevators and you will see. The difference is real. For what it’s worth, I don’t think it really matters whether you are short or tall (or perceive yourself as such) – if you have a kind of instinctive desire to be a bit taller, to gain a bit of advantage over someone or a situation, then you will always gain from adding height, and you will always get a great buzz from it. I have mentioned the considerations in postings I have made about how high should you go, and what kind of footwear you should wear in certain circumstances. Lifestyle, job, social life, leisure activities. But at its very lowest level added height works for every single guy, and at the higher level it works for a huge number as well. The key to deciding how far you can go kinda presents itself to you over time, but there is one certain thing: if you start on the lowish side you really just cannot go wrong. A few things have happened with me recently that have prompted these thoughts because I have been wearing my new 6” boots a lot and I just realized – in 5 years it means I have added totally undetectably 3”-4” to my height on top of when I wore lifts for all those years which really probably gave me just a couple on inches. 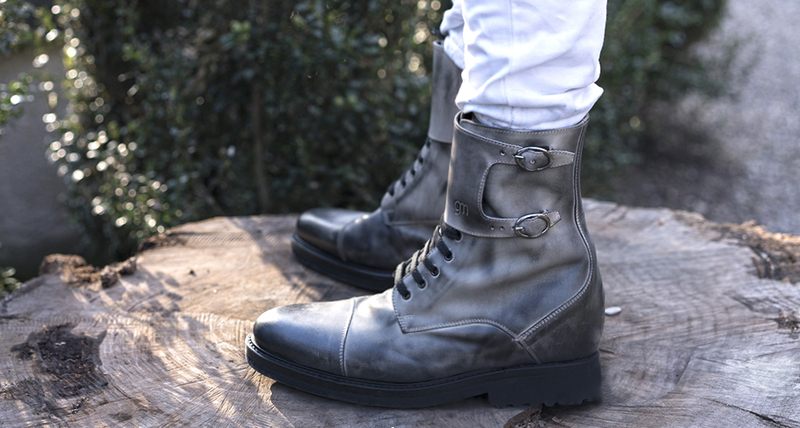 The 6” boots work incredibly well in many circumstances and have seen me add the vital recent extra inch or two over a couple of guys in my circle very convincingly. Being out and about and convincingly shading others who otherwise might be as tall or taller than you is a great feeling, and at the low and medium levels no-one ever notices you are immediately taller. I made time to get used to adding height to decide how far I could go. If you have never added height, you obviously want to go carefully at it, but it is not as obvious to others as you think. Unless your situation is specifically able to deal with it, I would not advise going straight for 6” boots!! But I went from 2” – 3”, to 4” to 5”, back to my favourite 4” ones and then up to 6” and no-one (NO-ONE) has noticed a thing. There are many many reasons for this, bound up with all the psychology of perception about others and observation. Even someone VERY CLOSE to you who is more aesthetically aware tends to put it down to just natural variations due to footwear (we all look different in flat dress shoes than Timberlands, for example, it doesn’t mean you are trying to look taller just because you decide to wear your Timberlands one night, and everyone allows for this). That instinctive allowance means you can get away with a LOT. Specially if you do it in stages. Irrespective of what you do at work, at night in a bar or club or out with friends, it’s very easy to push the limit upwards and I shall never forget first going out with my 4” boots, then the 5” and finally the 6”. And it is just no difficulty for me to go up and down. One of the big things is when you are stood by someone who YOU yourself know is either closer to you in height, or the same as, or even taller than. And now you are either taller or the same. And once you realize that no-one is querying your added height, or notices, it is an amazing feeling. One of my contacts on here was at a hockey match and he said that when he stood up with others it was such a buzz. He is 5’9” and has moved on after a few years to 4” boots. So he hits 6’ mark. He said to me the other day: “It’s weird but right at first after I went from just adding a bit of height by mildly uncomfortable lifts to my usual sneakers, I bought elevators. So I went from probably just under 2” to 4” and the ONLY person who knew was me. My girlfriend had no idea at all and I really found it almost impossible to believe. And my buddies just took it as read. Sure I would probably not wanna go with no shoes among other and that is an issue for me, but the bottom line is that no-one can tell under almost all circumstances I find myself in. And I am now ‘a genuine six-footer’, which I never expect would happen – Every day it gives me a great feeling. It was his comments that made me appreciate even more the joy of adding height like I do.